Well, we at the Kennedy house have decided to move in a different direction when it comes to our health. We haven’t been the best stewards of the bodies that God has given us. So much so that the girls think pizza is a food group that must be consumed as often as we should consume fruits and vegetables. It’s kind of healthy, right? I mean, it has TOMATO sauce, DAIRY in the cheese, GRAINS that make up the crust, and if you add VEGGIES and MEAT you round out the food groups. Can’t be all that bad, right? See….we’re horrible. For the past couple of months, Amy has been researching the different chemicals and ingredients used in the foods we buy/eat. My hat’s off to her. She is really concerned with the health and well being of our family. It’s funny that back in high school (way back before we even had our first date), Amy was referred to as “hippie chick” or “flower child.” Fortunately, she has decided to return to a bit of that mind set. It’s actually one of the qualities that I love about her. I also told her that I love the part of her that knows how to use a razor and toothbrush and hope she doesn’t forget that. And I know she won’t. 🙂 She was pretty much a practicing vegetarian when we started dating. I believe it was me and my love of Sonic Cheeseburgers that corrupted her. DANG YOU, SONIC! For the past almost 16 years that we’ve been together, Amy hasn’t been the biggest fan of meat, but has eaten it quite a bit. All that being said, we have been clearing out the junk in the house. Well….at least the food junk. Amy has made it a point to buy as much organic foods as possible. We have also planted a garden in hopes of having fresh produce. So, we’ve been in the process of getting on track. 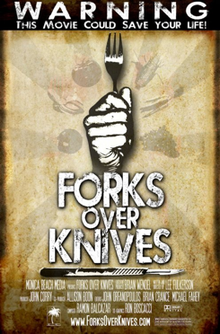 And then, this past Sunday night, Amy and I watched the documentary Forks over Knives. It was a very eye opening study into the consumption of meat and dairy and how it correlates to a higher risk of cardiovascular disease and cancer. I think that was the straw that broke the camel’s back for Amy. So, we here in the Kennedy household have decided to pursue a more plant based nutrition plan. There are a lot of words out there to describe what we are doing; some call it vegan, some call it plant based, some call it crazy. But whatever you call it, it’s our choice. I appreciate your input as to our dietary pursuits, but it’s just that…. OUR dietary pursuits. And quite frankly, what we’ve been doing so far hasn’t been working. So…a change is in order. Yeah, we’ll probably never be a true “vegan” household. And I will never be a true “vegetarian,” but our aim is to cut out meat and as much dairy as we can. If successful, I’ll probably be a “6 day a week” vegetarian. Also, don’t worry. Even though we have decided to label ourselves as now the most annoying house guests ever, we are not here to preach “veganism” to the masses. I have no qualms eating meat or others eating meat. I fully support hunters and the sport of hunting (as long as it is still a sport. I’m not a fan of those guided hunts where someone basically leads a deer out in front of a hunter, gives the “hunter” a gun and all but pulls the trigger for them.). This is just something that we as a family feel is important for us. So what specifically are you eating? I’ve contemplated this myself in the past but have no idea what you’d eat if you cut out enough to be vegan. I’m more interested in a healthy lifestyle and a balanced diet without losing the flavor. If I’m dissatisfied with the food I’m eating I’m not going to stick to the diet. LOL! That’s the million dollar question! We are still reseaching the different possibilities. One of the recipe sites that we are looking at is engine2diet.com. The guy responsible for the site is one of the sons of one of the doctors in the documentary. But I’m with you. I’m more interest in the health benefits of the nutrition plan than anything else. As far as the taste, well, you have to be prepared to sacrafice some of that. One of the reasons the food we love tastes so good is because of all of the chemicals in them. So, strip away the chemicals and you have a less tasty meal. But, we are learning that there are all sorts of things you can do to add flavor to meals. And, new flavors that we may not have considered before. We are taking it easy by slowly replacing our normal staples with organic or non-dairy alternatives. For example, our family LOVES peanut butter. For years we have bought Skippy Creamy Natural Peanut Butter. But upon further research, it’s not as “natural” as one may think. Looking at the ingredients shows that it is comprised of peanuts, sugar, oil, and salt. The biggest things to cut out are the sugar and salt. So, we are transitioning to Smuckers Natural Peanut Butter, where the ingredients are peanuts and a little salt. And to ease into it, we are mixing it with our existing Skippy peanut butter to get adjusted to the taste. How’s this going, 6 years later?